START-up strainers, like tee and cone strainers, are typically designed with very little debris holding capacity. They will have a higher differential pressure than a basket strainer. Cleaning these is also a major issue. Cone strainers have a pipe spool to remove. When removing the basket in a tee strainer, the debris has a tendency to fall out of the basket into the bottom of the strainer housing. Sometimes the debris passes downstream and causes damage to the device that is being protected. Absolute Filters has a research project to redesign a basket that will hold the debris. The main application for a "Y" strainer is gas and steam where cleaning is infrequent. "Y" strainers must be installed with a basket hanging so that the blow-off valve is near the ground. The screen in a "Y" strainer is removed from the bottom of the strainer. This is not a major problem with small "Y" strainers (under 6", (152.4 mm)). However, on larger strainers the cover can weigh over 100 pounds (45 kg) and are not easily removed. Lastly, the open area ratio on most "Y" strainers is less than 2 to 1, therefore there is no debris holding capacity. The major problem with a simplex strainer is that the system needs to be shut down in order to clean the basket. Therefore, simplex strainers piped in a duplex arrangement have become a preferred style. Simplex and duplex strainers are more attractive because they are installed in an upright position and the basket is lifted from the top. When the basket is filled with debris, it may be heavy and can only be removed in the vertical position. Simplex and duplex strainers can only be installed in a horizontal pipeline. None of the designs mentioned above can be used in a vertical pipe run. Over the last six months, Fluid Engineering has been reviewing the problems found in vertical piping. Vertical piping arrangements are mostly found in petrochemical and chemical processing systems. Since April 2003, Absolute Filters has offered a new type of simplex strainer with a tubular type basket design. 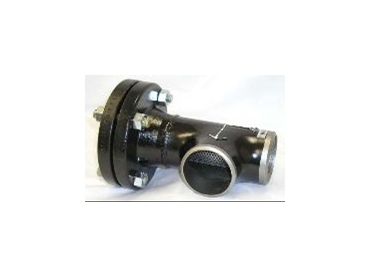 The 300 series strainer (Models 300, 301, 302, and 303) is designed for various installation positions such as: vertical-up, vertical-down, or as an elbow. The Model 300VD through 303 VD (designed for vertical-down) is a design where the flow is from outside the of the perforated basket with a manual blow down. The flow, as it washes over the basket, will force the debris to the bottom of the strainer housing, which has a built in sump. This flow pattern has been designed to act as a self-washing (self-cleaning) simplex strainer. Adding straightening vanes (SV) to any of the Models 300VD (also Models 301-303) creates a flow diffuser. This diffuser can eliminate up to 95 percent of the normal turbulence found after any elbow in a piping system. The turbulence will shorten the normal operating life of valves (mainly check valves), pumps, and flow measuring equipment. Using a Model 300 strainer in place of an elbow will eliminate 100 percent of elbow erosion. Erosion is the cause of most pipeline failures.